Tis the season to be thankful basketball fans. Looks like the NBA season will be resuming on Christmas Day. Maybe. Well they said they were going to play. And if/when they do, there will be some interesting rivalries reigniting on NBA Opening Day. There are five games to be scheduled on Christmas this year. First game will be at noon Eastern on TNT, followed by tip-offs at 2:30 pm and 5:00 pm on ABC, finishing up with 8:00 pm and 10:30 pm on ESPN. When the two other matchups are announced, check back here at SeatGeek to find the best prices for those games. The first game of the day is some good old fashioned hate between the Boston Celtics against the New York Knicks at Madison Square Garden. With rumors surrounding a potential arrival of Chris Paul to the Knicks and maybe a departure of Rajon Rondo from the Celtics, it will be interesting to see what players are found under the tree come Christmas morning. 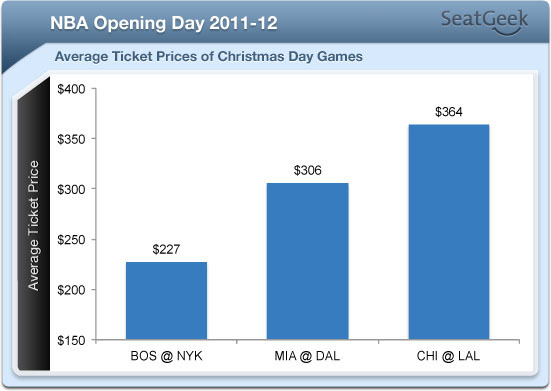 Relative to the other games, this one is a bargain with average ticket prices hovering at $227. Last season’s NBA Finals showdown between the Miami Heat and defending champion Dallas Mavericks. At this game, the Mavericks will be hoisting their championship banner and receiving their championship rings. LeBron’s envy might is not only due to his lack of a championship ring but also his inability to be the top attraction on Christmas Day. The honor of top billing belongs to the Chicago Bulls playing the Los Angeles Lakers at the STAPLES Center, with prices at an average of $364. A matchup that harkens to Magic Johnson vs. Michael Jordan, Derrick Rose leads the charge for his baby Bulls against Kobe Bryant’s veteran Lakers. The high price comes as no surprise as for Los Angelinos, as watching the Lakers on December 25th has become a Christmas tradition. In fact, this year will be Kobe Bryant’s 14th Christmas Day game in his 16-year career. Scoring machine Kevin Durant aka Durantula and the crew will visit the 3-time NBA Defensive Player of the Year Dwight Howard for a showdown in Orlando. The bigger news at the moment seems to be whether or not Howard will sign a contract extension with the Magic. Regardless, look forward to a fierce match up between offense and defense. Blake Griffin aka the highlight reel and his Los Angeles Clippers will travel up north to face the great-at-scoring-but-horrible-at-defense Golden State Warriors. By the way, the Warriors do have a rookie coach in Mark Jackson. This will be an interesting game to watch. The ticket data for game 4 and 5 aren’t available yet. If you don’t find tickets in your stocking this year to your favorite NBA Team, use SeatGeek to score on your next basketball game. And let us know how it went by hitting us up on Twitter @SeatGeek.